They drew throngs of cellphone-wielding service members everywhere they went. The USO Chairman’s Holiday Tour spent a busy week of visiting thousands of service members in Afghanistan, Turkey, Qatar and Germany. And we’ve got the photos here. Marine Gen. Joseph Dunford teamed with the USO to bring actors Scarlett Johansson and Chris Evans, retired NBA star Ray Allen, Olympic gold medalist swimmer Maya DiRado, country star Craig Campbell and mentalist and tour emcee Jim Karol to the service members. “With the leadership of General Dunford and help from our great celebrity friends, we are making this a holiday our service members and military families will never forget,” USO CEO and President Dr. J.D. Crouch II said. The USO has partnered with the chairman’s office for the last 16 years to produce holiday tours. This trip visited five bases, toured nearly a dozen military units and hosted four variety shows. 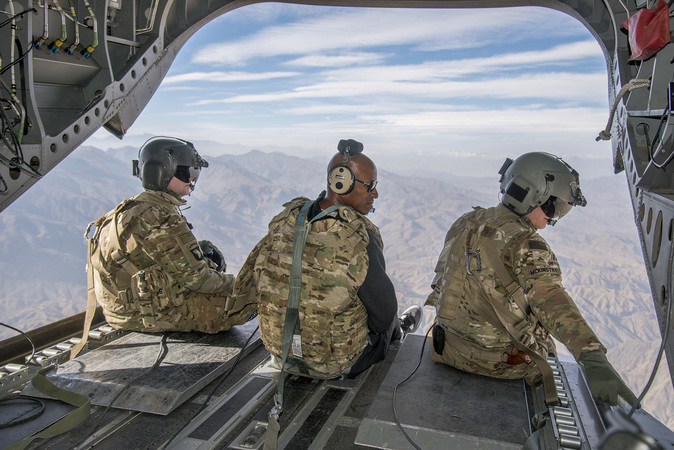 Former NBA star Ray Allen, center, sits on the back of an Army helicopter and looks out over Afghanistan during the USO Chairman’s Holiday Tour in December 2016. Scarlett Johansson visited service members in Turkey, Qatar, Afghanistan and Germany as part of the USO Chairman’s Holiday Tour. 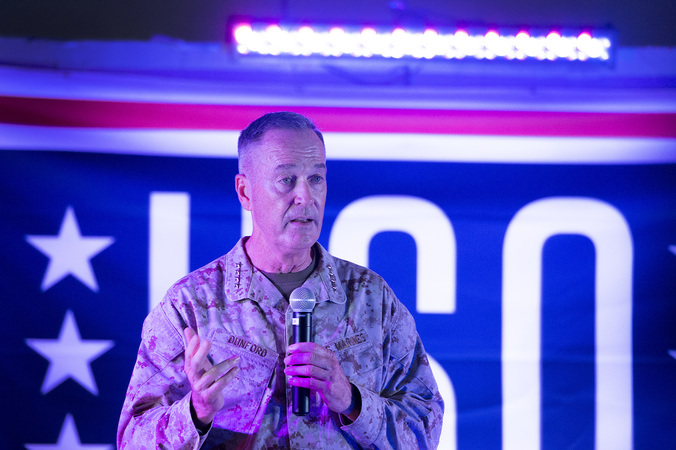 Marine Gen. Joseph Dunford, the chairman of the Joint Chiefs of Staff, speaks to the crowd before the USO show at Al Udeid Airbase in Qatar. 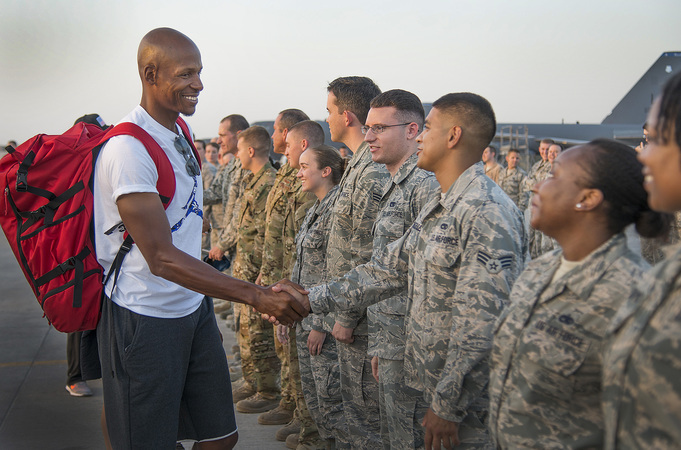 Ten-time NBA All-Star Ray Allen shakes hands with service members stationed in Qatar during the USO Chairman’s Holiday Tour in December. 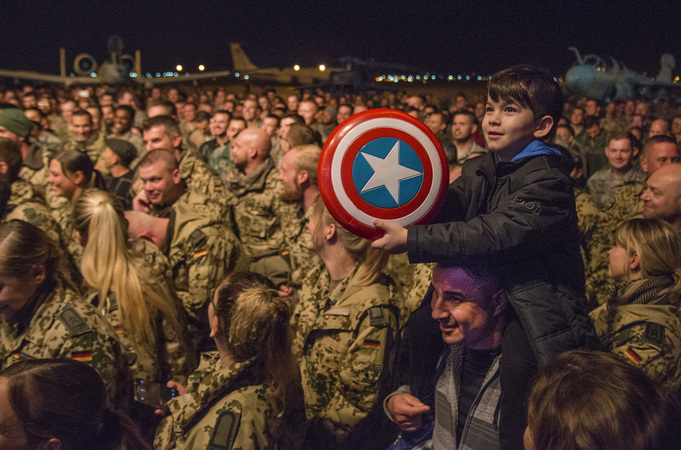 A “Captain America” fan waits for actor Chris Evans to come on stage at a USO Chairman’s Holiday Tour show at Al Udeid Airbase in Qatar. While on the ground, the group met with an explosive ordinance disposal team, got to see multiple military aircraft, spoke with operational maintenance crews and a missile brigade and participated in a security forces K-9 demonstration. It was the second USO tour each for Gen. Dunford, Johansson and Campbell, who have collectively visited seven countries and entertained more than 7,000 service members and their families since 2008. It was the first USO experience for Evans, Allen, DiRado and Karol.